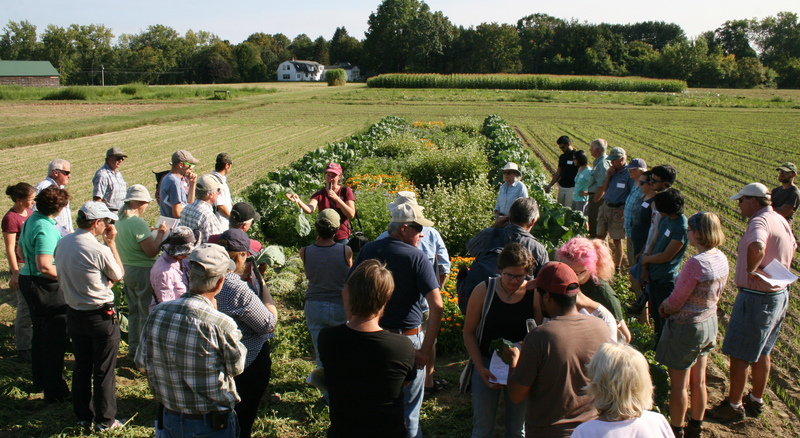 On a perfect late summer evening, farmers from Massachusetts, Vermont, and New Hampshire hopped on a hay wagon to catch a ride to the UMass Extension research field plots. 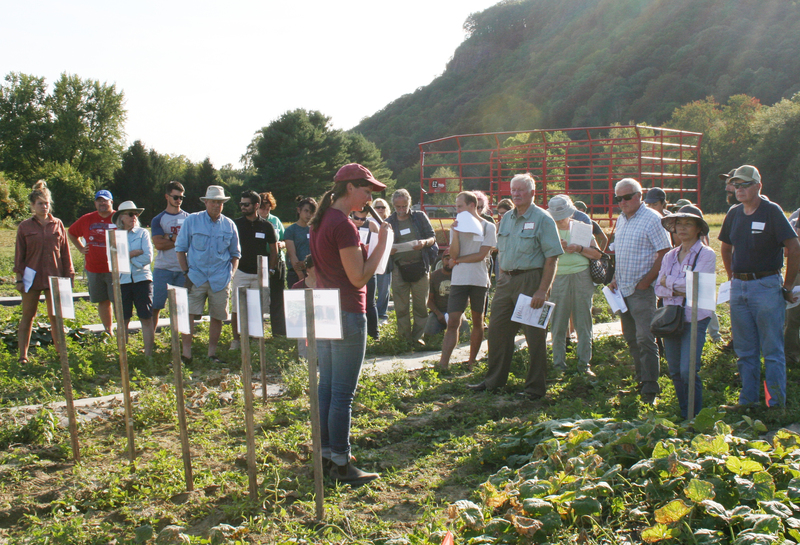 UMass Extension educators and specialists met with over 40 growers on a tour of ongoing research trials at the UMass Crop and Animal Research and Education Center in South Deerfield, Mass. Growers like Maureen Dempsey from Intervale Farm in Westhampton, Mass., and Tom Petcen, owner of Pop’s Farm in Hatfield, Mass., zeroed in on harmful insects. Petcen said, “I came to learn about the newest results in pest management. This twilight meeting is always interesting and some of their trials are very successful.” A Wrentham, Mass. farm couple attended specifically to understand better methods for controlling aphids on their vegetable crops. For their part, Extension educators shared results from trials on cabbage aphid management, cucumber disease management and shared experiences growing ethnic crops. In one research plot, wilted, diseased mounds of cucumbers grew next to sections that thrived. In this study, researchers were comparing different cucumber varieties for resistance to important diseases and overall yield. They also investigated the economics of different management strategies, and compared a resistant and susceptible cucumber under different fungicide spray programs. They found that the conventional fungicide program was most effective at controlling downy mildew but the resistant variety had better yields and lower costs to manage and was therefore more profitable. Other research trials included: nitrogen contributions from cover crops for fertility, basil fusarium research, grape and cherry tomato variety trials and ethnic crop production and marketing. Following the tour, growers and Extension specialists participated in dinner and a roundtable discussion.